New Delhi: MarutiSuzuki India Ltd, the country’s biggest car maker, struggled to cope with resurgent labour trouble that disrupted its Gurgaon plant and tension escalated at the Manesar unit, raising the prospect of violent confrontations amid a reduced police presence because personnel have been assigned to election duty. “The production at the company’s Gurgaon plant has also been impacted today due to the strike at Suzuki Powertrain India Ltd," the company said in a statement. “Supply of diesel engines and also transmissions from Suzuki Powertrain India Ltd has stopped." The company could only produce 1,800 vehicles at the Gurgaon plant against the normal production run of 2,800 units. The plant’s functioning is threatened by striking workers who are bent upon violence, the company said. “There are not enough security personnel around because of the polls happening at Hisar in Haryana," said Maruti Suzuki chairman R.C. Bhargava. “We hope (they will) be back as soon as possible." “We make cars, that is what we are best at," he said. “It is not our job to maintain the law and order situation." The company said workers had indulged in random acts of violence such as beating up company managers, supervisors and colleagues who didn’t support the strike. A representative of the protesting labour union denied the allegations. The labour trouble had resumed on Friday, when at least 7,000 employees stopped work at parent Suzuki Motor Corp.’s units and other parts suppliers in Manesar to protest against what they said was Maruti’s decision to renege on a promise to take back about 1,000 contract workers who had signed its “good conduct bond". Maruti’s Manesar workers had ended a month-long strike barely a week ago, giving the car maker hope that it could step up production ahead of the festive season. A senior Gurgaon police officer said the authorities were keeping a close watch on developments. “As always, we have been providing security to them," said joint commissioner of Gurgaon police A.S. Mittal. He declined to give details on the number of policemen stationed at and around the plant. Gunshots were fired by a labour contractor at a Suzuki motorcycle factory on Sunday morning after workers there also downed tools in support of the Manesar action, a Maruti spokesman said. A case was registered against a person who belongs to Tirupati Associates, which hires contract workers to work at factories around the Industrial Model Township in Manesar. Given the possibility of violence breaking out, engineers and managers at Suzuki Powertrain were told to stay at home, while Maruti instructed employees to be cautious. “We were not called to work today," said an engineer with Suzuki Powertrain who did not want to be named. “We will go once we get a call from the company. The situation out there is very dangerous. The workers are very aggressive." 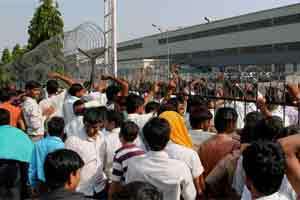 Maruti Suzuki reiterated on Monday that it continues to be concerned about the safety of its employees. “The company has so far rescued about 500 workers who were being held under duress by the striking workers in the factory. These workers were rescued with the help of the police," it said. “Many of these workers have been beaten up by the striking workers." The Society of Indian Automobile Manufacturers (Siam), a lobby group, said the labour trouble at Maruti was one of the reasons car sales have slumped. “Maruti commands a 50% market share. So if its production is hit, there will be an impact on the industry," said S. Sandilya, president, Siam. In the April-September period, domestic car sales fell 1.36% to 909,283 units from 921,812 units in the year-ago period. “What disturbs the industry is that the agreement signed between the management and the union has been broken," Sandilya said. “An agreement has no validity if you don’t merit it. Some conditions being signed on have been violated, which has now led to a law and order problem." Sandilya said the workers have the right to strike. But no industry can prosper if either the workers or the management violates agreements. “Political intervention is called for only when the situation gets out of hand and there is an issue with law and order, because the company cannot take law into their hands to resolve the matter," he said. “It is not acceptable that while protesting, properties should be damaged. The law of the land has to be respected," he said.